Rabbit anti Human, Mouse ATF2. 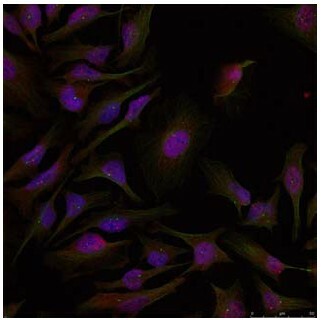 Product is tested for Immunocytochemistry/Immunofluorescence, Western blot / Immunoblot, Paraffin Sections. Synthetic non-phosphopeptide derived from human ATF-2 around the phosphorylation site of threonine 71 or 53 (T-P-TP-P-T). Western Blot: 1/500 - 1/1000; Incubate membrane with diluted antibody in 5% nonfat milk, 1X TBS, 0,1% Tween-20 at 4°C with gentle shaking, overnight. 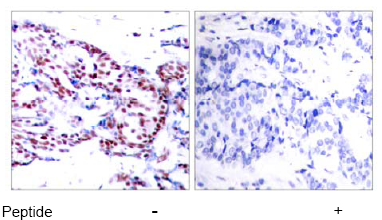 Immunohistochemistry on paraffin sections: 1/50 - 1/100. ATF2 (Activating Transcription Factor 2, CREBP, HB16, CREB2, TREB7) is a member of the ATF/CREB family of basic region leucine zipper DNA binding proteins that regulates transcription by binding to a consensus cAMP response element (CRE) in the promoter of various viral and cellular genes. Many of these genes are important in cell growth and differentiation, and in stress and immune responses. ATF2 is a nuclear protein that binds DNA as a dimer and can form dimers with members of the ATF/CREB and Jun/Fos families. It is a stronger activator as a heterodimer with cJun than as a homodimer. Several isoforms of ATF2 arise by differential splicing. The stable native full length ATF2 is transcriptionally inactive as a result of an inhibitory direct intramolecular interaction of its carboxy terminal DNA binding domain with the amino terminal transactivation domain. Following dimerization ATF2 becomes a short lived protein that undergoes ubiquitination and proteolysis, seemingly in a protein phosphatase-dependent mechanism. 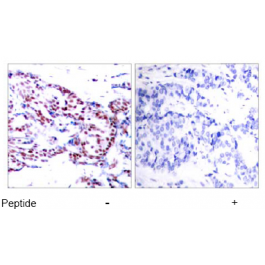 Stimulation of the transcriptional activity of ATF2 occurs following cellular stress induced by several genotoxic agents, inflammatory cytokines, and UV irradiation. 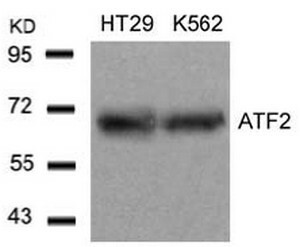 This activation requires phosphorylation of two threonine residues in ATF2 by both JNK/SAP kinase and p38 MAP kinase. ATF2 is abundantly expressed in brain. Sevilla A, et al. (2004) J Biol Chem. 279(26):27458-27465. Waetzig G H, et al. (2002) J Immunol. 168(10): 5342-5351. Abdel-Hafiz H A, et al. (1992) Mol Endocrinol. 6: 2079-2089. Gupta S, et al. (1995) Science. 267: 389-393. Van Dam H, et al. (1995) EMBO J. 14(8): 1798-1811. Store the antibody at -20°C. 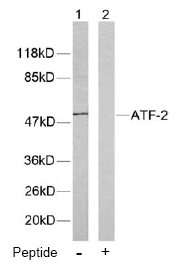 ATF-2 antibody detects endogenous levels of total ATF-2 protein.